The myriad world of deck railing - what’s for you? Deck railing is a very important facet of the overall look and feel of your decking. Here we will look at a range of broad options to making that choice based on style, cost and what you may want yourself. Health and safety – glass? It might have to be there for health and safety reasons – you don’t want your toddler / drunk teenage daughter stumbling off a 10ft drop and into a world of hospitals and worry! If the view is that good and you really want to celebrate it minimally then you could go for the choice of a glass railing system. One of the more expensive options, it gives a sense of invisibility to the barrier even while protecting your assets – the toddler may not see it until they bang their nose but a sore nose and tears is better than the other option! 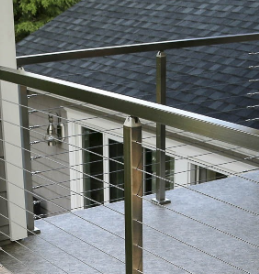 Whether you have that view or no, you may want to have a deck railing system that makes a statement. This could be using branches from a tree in a funky, almost natural style so while people see through it they are lifted by the presence of the barrier between them and the world it is showing off. Rope is another way of having funky deck railings. You can buy high quality rope from yacht chandlers and perhaps use netting beneath. Don’t worry about it lasting as there are many plastic forms of rope that look at least as good as hemp and other natural fibres. If kept taught enough between balustrades there won’t be much of a risk of people being suspended in nets after a stumble! You can’t look at deck railing without a nod to traditional forms. Whether with steel balustrades and wood between or pure metal / wood you can’t go wrong by travelling the path of those before you. Again, don’t feel too hemmed in by doing so as there are literally hundreds of variations that you can apply using different woods (and their treatments) as well as metals to achieve the style that really matches you. Those who live on the praise of others lead empty lives. Ultimately when it comes to deck railing you really just have to put something up that you like and feel will stand the test of time. Isn’t your decking your own at the end of the day?